The theme is coded with performance in mind, squeezing loading time of your website under 2 seconds even without using advanced performance improvements techniques! Supports Jetpack plugin to create a food menu (support Food Menus custom post type, infinite scroll, contact form builder, tiled galleries, social sharing buttons, related posts,…), search engine optimized markup (supports Google Recipe View), Theme Hook Alliance action hooks, translation-ready code, header slideshow, customizable colors and layout, and other cool features. Supporting Jetpack plugin to provide a Food Menu functionality you get peace of mind that the theme is fully transferable and you will never loose your precious restaurant (café) website content. The theme extends this functionality even further by allowing a sub-sections in your food menu! Do you need an online table booking functionality? No problem! The theme is compatible with awesome Restaurant Reservations plugin. Set the plugin up and you are ready to rock! Do you plan to write online recipes in style? Or are you restaurateur who is not afraid to reveal the secrets? 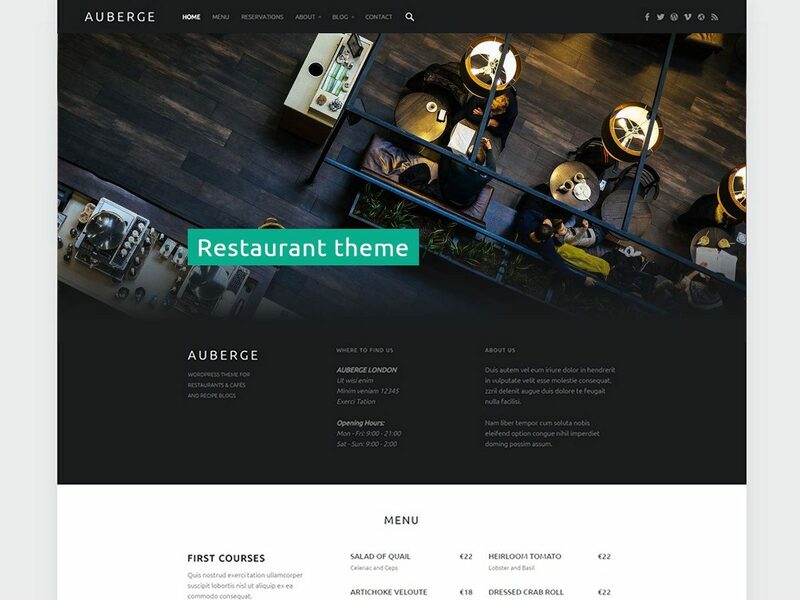 Auberge Plus got you covered and you even don’t need to study long user manual on how to create recipes with the theme. You already know it, it’s that simple! This is a simple theme, you only get what you need. The theme contains no shortcodes, no sliders, no page builders. So, it does not restrict you in any way – use your preferred ones! It is recommended to use Beaver Builder page builder plugin with this theme to create stunning pages directly in front-end of your website. The theme fully supports this amazing page builder plugin!